Project Healing Waters Fly Fishing (PHWFF) began in 2005 serving wounded military service members at Walter Reed Army Medical Center returning from combat in Iraq and Afghanistan. Since then, PHWFF has expanded nationwide, establishing its highly successful program in Department of Defense hospitals, Warrior Transition Units, and Veterans Affairs Medical Centers and clinics. The Project Healing Waters Fly Fishing program provides basic fly fishing, fly casting, fly tying and rod building classes, along with clinics participants ranging from beginners who have never fished before, to those with prior fly fishing and tying experience who are adapting their skills to their new abilities. 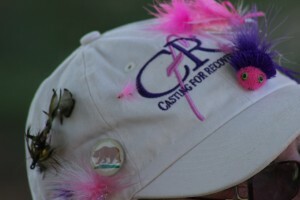 All fly fishing and tying equipment is provided to the participants at no cost. Fishing trips, both one day and multi-day, are also provided free of charge to participants. PHWFF is unique in that our volunteers are teaching classes on an on-going, long term basis. It is much more than a one day fishing trip. 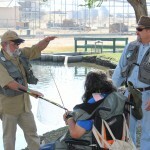 For many participants, particularly disabled veterans, the socialization and camaraderie of the classes are just as important as the fishing outings, and provide them a new activity. Project Healing Waters Fly Fishing relies on Federation of Fly Fishers, Trout Unlimited, and independent fly fishing clubs to conduct the program at the DOD and VA facilities across the nation. The volunteer staff and outings leaders include experienced fly fishers and guides, all of whom donate their time and knowledge to support PHWFF participants. In order to have a viable program, three groups must co-exist: a fly fishing club willing to provide the volunteers and organize the program, a DOD or VA medical facility willing to host the program, and injured military members or disabled veterans willing to participate. Because each of these groups is unique, no two Project Healing Waters Fly Fishing programs will be exactly the same.